BIGWU President Vincent Cabrera addressing union members before the start of the May Day March at Circular Road, San Fernando. Banking, Insurance, and General Workers Union (BIGWU) president general Vincent Cabrera has called for the implementation of a migration policy following the influx of Venezuelans into the country. Addressing a large contingent of workers before the May Day march through the streets of San Fernando, Cabrera said local employers were taking advantage of the Venezuelans who were seeking employment opportunities in TT, as some were being paid as little as $40 aday. 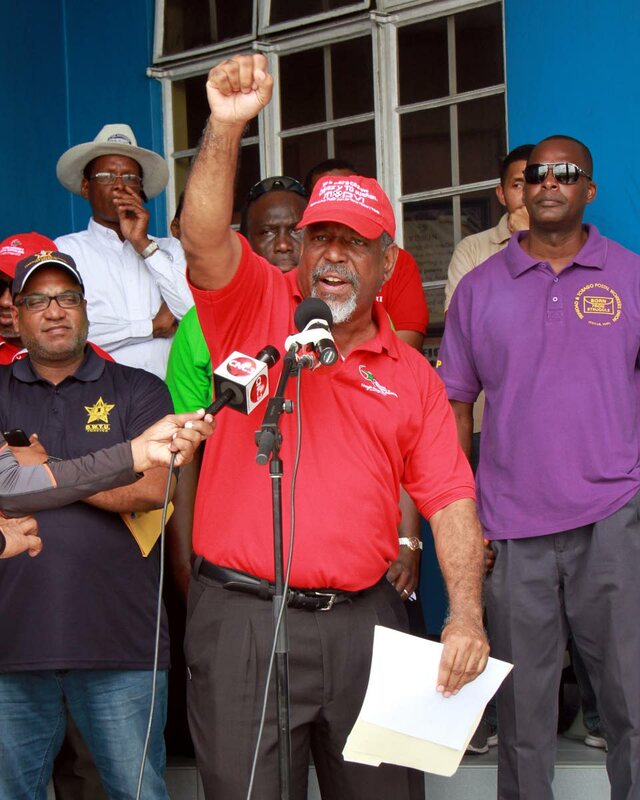 “I am saying that we must have concern for our labour, and whether it is poor wages being paid to Venezuelans, Nigerians, Portuguese, Guyanese and many other immigrants, it is time for us to call on the government for an appropriate migration policy for TT,” he said. He said a general strike may be the only alternative, as government did not seem willing to settle its outstanding negotiations, including those with teachers and public servants, who have not had a salary increase since 2010. “Perhaps the only thing that will make them get serious and raise wages up from 2010 to 2018 is a blasted general strike…2010 salaries is not right. Children of workers are suffering,” he said. He said government was intent on the privatisation of Petrotrin, and the next state-owned entities may be WASA and First Citizens Bank. “And if you not careful they will be privatising education and health too, and if you not careful one of these days you will get up and put on a TV station, turn to CNN and see a map of TT with a mark ‘For Sale,’” he said. Reply to "Cabrera: Venezuelans being exploited"